In August 1814, the United States army was defeated just outside Washington, D.C., by the world's greatest military power. President James Madison and his wife had just enough time to flee the White House before the British invaders entered. British troops stopped to feast on the meal still sitting on the Madisons' dining-room table before setting the White House on fire. The extent of the destruction was massive; finished in wood rather than marble, everything inside the mansion was combustible. Only the outer stone walls would withstand the fire. The tide of the War of 1812 would quickly turn, however. Less than a month later, American troops would stand victorious at the Battle of Fort McHenry. Poet Francis Scott Key, struck by the sight of the American flag waving over Fort McHenry, jotted down the beginnings of a poem that would be set to music and become the U.S. national anthem, "The Star Spangled Banner." In his compelling narrative style, Peter Snow recounts the fast-changing fortunes of that summer's extraordinary confrontations. Drawing from a wealth of material, including eyewitness accounts, Snow describes the colorful personalities on both sides of those spectacular events: including the beleaguered President James Madison and First Lady Dolley, American heroes such as Joshua Barney and Sam Smith, and flawed military leaders like Army Chief William Winder and War Secretary John Armstrong. On the British side, Snow re-creates the fiery Admiral George Cockburn, the cautious but immensely popular Major General Robert Ross, and sharp-eyed diarists James Scott and George Gleig. 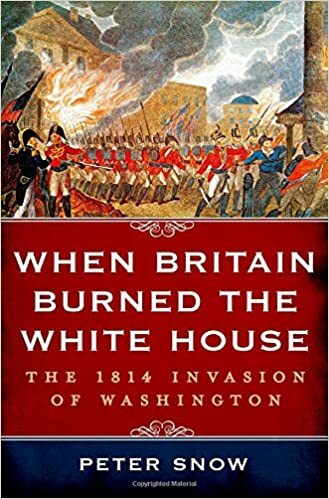 When Britain Burned the White House highlights this unparalleled moment in British and American history, the courageous, successful defense of Fort McHenry and the American triumph that would follow, and America's and Britain's decision to never again fight each other. unprotected; their 4,500 men faced a potential enemy twice or three times their number; British infantry alone would have to tackle American guns, cavalry and footsoldiers on ground of their choice; their enemies would be fighting for their capital, their homes and their families. But Cockburn – and Ross, whether he finally gave way to his own inner conviction or to Cockburn’s impassioned persistence – could count on one proven asset that now had to be decisive: the quality of their soldiers.